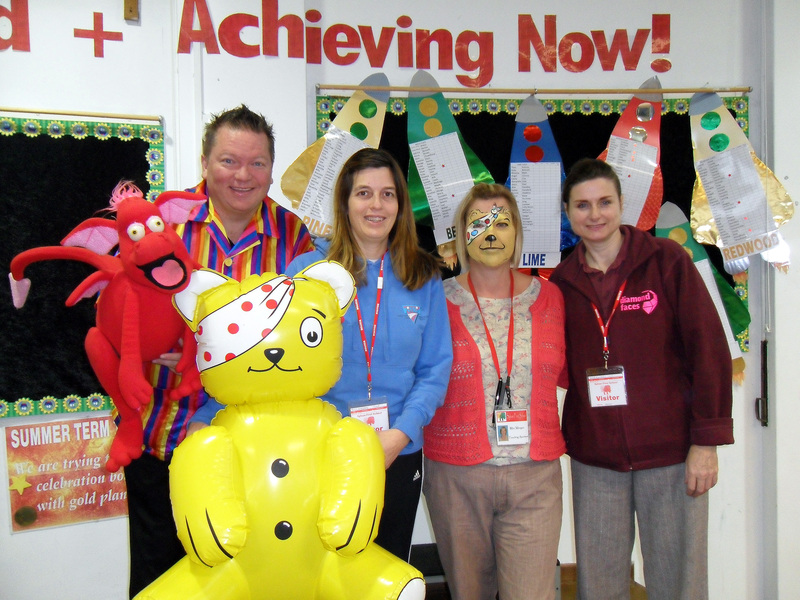 On Friday 9th November, I visted 3 local schools with the Kids Party Roadshow team including Sylvan, Courthill and Lilliput First Schools as part of their fundraising for Children in Need. Kids Party Roadshow based in Dorset is a newly formed venture between FitKid, Mr Merlin and Diamond Faces is an exciting children’s Birthday Party Celebration including Magic, Face Painting, Glitter Tattoos and Fitness Fun. To start the Children in Need fundraising, 4 teachers from each school were picked to join in the fun with a large audience of very excited children. One teacher was turned in to a puppet by Mr Merlin which caused extensive giggles from the watching crowd, two teachers participated in a fun fitness challenge run by myself and Ronnie from Diamond Faces painted Pudsey on a teachers face and the teacher agreed to wear the facepaint for the rest of the day. The first Kids Party roadshows will be available from January 2013 and will encompass a magic show by Mr Merlin and Okey Dokey, Each child will be offered a facepaint or a glitter tattoo and will enjoy fun fitness games and activities with FitKid. To find out more about booking a party for your child, please contact vickie@fitkid.co.uk for more details.